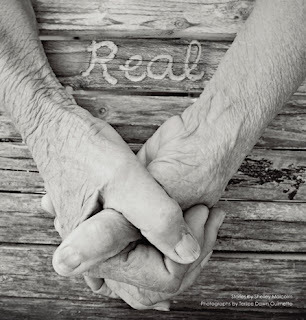 “REAL” is a collection of 60 inspirational stories by Shelley Malcolm, with photos by Terilee Dawn Ouimette. The stories are deeply revealing, while the photos are anonymous, focusing only on each subject’s hands. The book is divided into 11 different sections focused on one particular element of life - hope, love, inspiration, work, etc. Each of those sections includes pictures of hands and stories based on those pictures. The stories are about people from all walks of life including the rich and famous and people pinching pennies. As unique as each of the individuals are, they are all joined together in this beautiful book. I received a paperback copy of this book to review but could see myself buying a hard cover version as a coffee table book for my mother-in-law. The pictures are beautiful and inspiring even without the written stories, and I am amazed by how much someone's hands can tell about their life. It makes me wonder what story my hands tell. I recommend this book, especially for anyone who loves photography and inspiring stories. You can purchase a copy of the book here. Proceeds from all sales are split among various charities. If you'd like to see what other people are saying, you can check out other stops on the blog tour. *I received a free copy in return for my honest opinion and review.